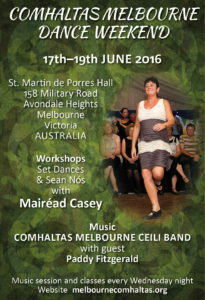 September 2015 - Comhaltas Ceoltóirí Éireann | Comhaltas Melbourne Branch Inc.
MAIRÉAD CASEY, a well known Irish sean nós dancer and Irish set dancing teacher from Co.Longford in Ireland, will be performing and doing work shops from 17th- 19th June 2016. See more about Mairéad below. Melbourne Comhaltas is also pleased to announce that we have collaborated with the National Celtic Festival for 2016 where Mairead will also be teaching and performing on the 10th-13th June 2016. WEEKEND MAIN VENUE: St. Martin de Porres Parish Hall, 158 Military Rd., Avondale Heights (Melways Reference: 27 E5). FRIDAY 17th June 2016: 7.00pm : Meet & Greet evening in the Quiet Man Irish Pub. Meal bookings necessary. Plenty of chat, eating and dancing!! Melbourne Comhaltas is delighed to welcome Mairead Casey to lead our set dancing workshops.Hailing from Newtowncashel, Co..Longford, Mairead grew up in a very musical family and has been dancing all her life. She began teaching set dancing and sean nos dancing in 1996 with Mick Mulkerrin. In addition to teaching at the Willie Clancy Festival, Mairead has led workshops all over Europe, England Scotland , Ireland, America and Canada. She has also danced at many concerts, including for The Chieftains. PLEASE NOTE: From 2016, the Melbourne Comhaltas weekend will be held every June and not August as in previous years.